The 1991 Mustang GT received the same new 5 spoke, 16 inch, aluminum wheels as the 1991 5.0 LX. These wheels were so popular, that many older owners of Mustangs, bought them. The GT and LX convertible also received the new convertible top which when opened, fit more flush with the body. Specific for the 1991 GT was the 1990 GT carryover items such as solid grille with center mounted Ford emblem; front, side and rear aerodynamic body skirts with integrated fog lamps; and 225hp, 5.0L, High Output, V8 engine. 1991 Mustang GT with a modified hood and engine and new silver and black paint. This Mustang has its original new five-spoke wheel design available in 1991. All 1991 hatchbacks had the low side coves with rear and front simulated wheel air vents and rear spoiler. 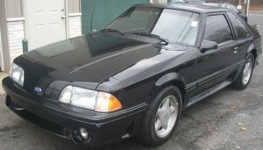 Black 1991 Mustang GT hatchback with a 302ci, 5.0L, 225hp V8 engine. Twilight Blue 1991 Mustang GT fastback owned by Jonathan Noles from Georgia. It has the 302ci V8 and an automatic transmission. Jonathan tells us more, "I bought the car from my sister in late February of 2007. Her and her ex husband bought the car from a used car dealer in North Carolina. I am the third owner of this car and I plan to be a long term owner. When I bought this car, the entire exterior paint job had deteriorated to the point that the car seemed (faded) teal, instead of Twilight Blue. The only way you could gauge how the paint originally looked was inside the door jam. Long story short, this car has come a long way and I plan to restore it to the same condition it was when it originally sold off the lot." Silver 1991 Mustang GT hatchback owned by Gary Ayers from Virginia. It has a 302ci Engine. Gary tells us, "This 1991 Mustang has a Mustang Attitude! Check it out and see what you think!" I agree, it does have Attitude. Twilight Blue over silver 1991 Mustang GT hatchback with a 5.0 liter (302ci), high output, V8 engine. Modified White 1991 Mustang GT hatchback with Cobra R 17 inch wheels and a modified 5.0L V8 engine. Bright Red 1991 Mustang GT convertible with a white and red interior. Bright Red is one of three shades of red offered on the 1991 Mustang. The other two are Medium Red and Wild Strawberry - both of which are darker shades of red. Ultra Blue clearcoat 1991 Mustang GT convertible with Medium Titanium lower Tu-tone and 5-spoke cast aluminum wheels. This photo is part of the 1991 Ford Mustang Promotional Catalog. Deep Emerald 1991 Mustang GT hatchback with a two-tone paint. The lower is painted Titanium Frost. The interior is gray in color. It has a 5.0L V8 engine and a manual transmission.